Too few people realise that the history of the Irish in America does not begin with the potato famine but goes back a century earlier to the 1740 migration of Presbyterians from Ulster. The best book about this hidden history is the brilliant Albion's Seed by David Hackett Fischer, but Senator Jim Webb has written an entertaining primer called Born Fighting, both of which are well worth a read. Part of Jim Webb's premise is that the Ulster Scots' fighting and a feuding ways meant that they were predisposed for military service and that Scots-Irish officers were the backbone of Washington's Army, the Union and Confederate Armies in the Civil War, the Doughboys of WW1, the GIs of WW2 and Vietnam. Now as Hackett Fischer points out in Albion's Seed these Borderlanders from Ulster loved liberty, read the Bible, were fiercely independent, loved to fight, hated central government, were suspicious of outsiders and foreigners and they really loved to go to revival meetings to hear a preacher talk. These revival meetings are vividly described by Hackett Fischer with the travelling charismatic preacher cajoling, enraging, joking with and entertaining his audience. Sound like someone we know? But where did Trump learn this trick? He's not a McCoy from Kentucky, he's a rich kid from New York, the son of a well off German immigrant, who, furthermore, eschewed fighting in Vietnam by dodging the draft several times (unlike Jim Webb, John McCain and his cohort). 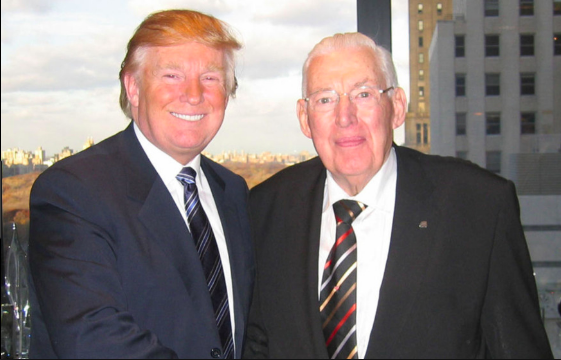 The answer is to look at Trump's Scottish Presbyterian mother, Mary Anne MacLeod. 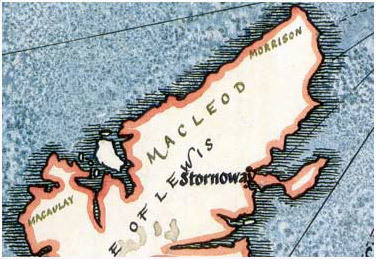 Mary MacLeod came from Stornaway on the island of Lewis-Harris in the Outer Hebrides. If you've seen the movie Highlander you already know about the Clan MacLeod (of which Trump and his mother are members) if you haven't you can find out about them here. Lewis-Harris is one of the weirdest places in Britain, indeed in all of Europe. Rainy, stark, beautiful, its the only place in the British Isles where church attendance is actually going up. There are at least six different Presbyterian dominations on Lewis-Harris all at war with one another but who all insist on strict Sabbath observance, thrift, hard work and Bible study. In some of the churches the Presbyterian practice of Psalmody is carried out in an ancient Scots gaelic which to my ears is extraordinarily beautiful. I grew up a Presbyterian too but we went to the Presbyterian Church of Ireland which is a dour, sensible, Calvinist, unshowy, deliberately boring faith. There were no charismatic preachers in my church and none wd be tolerated by the Elders. But there was another Presbyterian Church in Ulster at that time: the Free Presbyterian Church which was run by Ian Paisley. Ian Paisley you'll recall was a loud mouthed demagogue who was suspicious of foreigners (especially Europeans), who was Evangelical and who was bizarrely obsessed by the Pope (in Paisley's eschatology Pope John Paul was the Anti-Christ). Trump comes from or at least is channeling this tradition. I know these people. These are my people and they are people that you seldom see in the media except portrayed in negative ways. They're pissed off and they might well vote for Trump in the primaries and the election. Watch for the vote in Arkansas, Missouri, W Virginia, Tennessee & Michigan....Exactly like Paisley Trump loves Israel, loves Scotland, worships guns, says his favourite book is the Bible is determinedly Nativist and he says he thinks the central government is selling out the country. Trump though seems to have dropped the anti-Catholicism (at least I think he has, I wonder if his lambasting of Mexicans is at least partly because of their religion). If you're interested in this stuff you can buy Albion's Seed, here. The great Jonathan Meades's, wonderful, eccentric visit to Lewis-Harris is worth watching from part 3 onwards, here. A left field look at the career of John McCain, Jim Webb & Oliver North (3 Ulster Scots) and the legacy of Vietnam is the excellent Nightingale's Song which you can get, here.